It was almost time for my mini-book tour to the West Coast, and I was worried. "Old buddies and new friends are coming to the events," I told my sister. "How can I possibly make each one feel loved in a five-minute interaction, especially when I'll be so distracted?" "It's not about them this weekend, honey," my sister responded. "You have to let them love you." First it was the guy at the rental car company who, upon hearing I'd escaped the Arctic front in Boston, upgraded me to a convertible so I could relish the Bay Area's seventy-degree weather. Kepler's in Menlo Park invited me to take a tour and sign stock, which I did with pleasure, and then I drove around the campus of my alma mater with the top down, marveling at the changed and the unchanged. 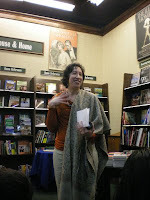 Jennifer Laughran of Not Your Mother's Book Club brought samosas, bindis, lassis, and teens to my next event at Books, Inc. College buddies I hadn't seen in years and new friends from Facebook, Child_Lit, and Twitter came to celebrate my book launch party. Many stayed for the workshop on creating a sense of place in fiction. Combining business with pleasure (although that's fairly common in this vocation), my sisters and I had a spa day, Ma cooked up a storm, and Baba beamed with pleasure at our presence. Then it was off to Bellevue, Washington, where the mountains sparkled (just for me?) in the sunshine. The hospitality and savvy of Barnes and Noble's Brenda Gurung and the Aban Auntie's Rava made by rgz diva Holly Cupala ensured the success of my launch party up there. I was overwhelmed by the friends from inside and outside the writing world who came to shower SECRET KEEPER -- and me -- with blessings and good wishes. along her husband and a book tour goodie bag. I raced to the bustling Bellevue Regional Library, where teen librarian Darcy Brixey had gathered a group of amazing teen writers for another workshop. More samosas, naan, and tamarind sauce. Not to mention bindis. And my rgz pack lined up along the back of the room, still cheering me on. Do those readergirlz know how to party! After all the work was done, Dia Calhoun, Holly Cupala, Lorie Ann Grover, Justina Chen Headley, and Jackie Parker took me to dinner, lavishing me with gifts, laughter, and rgz love. So yes, I was spoiled last weekend, and it was about me (which isn't good all the time, but once in a while, it rocks). My sister's advice was apt for a celebration of a novel about sisters, wasn't it? Thanks to one and all, and now ... sigh ... it's back to the real world.